and Sculptures, Topped by a Shih Tzu Sheriff Figurine. Secure Shopping, Only United States Shipping. As a dog lover you know firsthand that while dachshunds are diminutive in size, they are among the most loyal companions. Now, they represent the long paw of the law in our To Paw-tect & Serve Dachshund Figurine Collection, inspired by the imagery of acclaimed artist Blake Jensen and available only from The Hamilton Collection. These furry defenders are just waiting to patrol your home, beginning with Issue One, Paw & Order. Next to arrive will be Issue Two, Paw-tecting The Community. Soon your collection will continue with Issue Three, In the Name of the Paw, and additional dachshund figurines, each a separate issue to follow. What a fine force of canine constables! Each dachshund police collectible in this limited-edition figurine collection is handcrafted in artist's resin and hand-painted by Master Artisans. You're sure to fall in love with every dashing detail, from their heart-melting eyes to their handsome uniforms - complete with charming details like official-looking hats, handcuffs and silvery name tags. Doxie lovers everywhere are sure to find these doggie patrolmen irresistible, so don't wait. Order now! Dogs fill your heart with joy and happiness whenever you see them. Now you can keep that feeling close to your heart with the Pawsitively Perfect Together Dog Pendant Necklace, a fine jewelry design exclusively from The Bradford Exchange. The Bradford Exchange proudly supports the ASPCA's mission to save animal lives, and this fetching women's crystal pendant is a perfect expression of that support, sparkling with over 70 genuine Swarovski® crystals! Expertly handcrafted with gleaming sterling silver plating, this glittering heart-shaped pendant features two adorable dogs, one in black crystals with a white collar and the other with white crystals and a black collar. Your necklace arrives in a custom presentation case complete with a touching sentiment card, perfect for safekeeping and gift-giving. With so many dog lovers out there, strong demand is expected for this dog-themed jewelry. So don't wait. Order now! With those tender loving eyes and that irresistibly cute face, your precious Yorkie fills your heart with an abundance of love. Now, let your faithful friend shine like never before with a Yorkie beaded bracelet handcrafted with porcelain and art glass: the Reflections of Love Yorkie Bracelet. A Bradford Exchange fine jewelry exclusive featuring radiant Murano style art glass beads, charming dog art and more, this bracelet is a stylish and artistic expression of how much you love your Yorkie! Each one-of-a-kind bead in this bracelet glows with warm honey and chocolate brown tones inspired by the neutral palette of Pollyanna Pickering, famed Yorkie artist. Her expressive images of this beloved breed are expertly fired onto the genuine porcelain beads, while the Murano style art-glass beads feature embedded layers of 24K-gold leaf in the center. Since the beads are individually handmade, no two bracelets look exactly alike! A 14K gold-plated heart charm with a genuine crystal accent and engraved sentiment complete the bracelet, which arrives in a velvet pouch and gift box. Strong demand is expected, so don't delay. Order now! There is nothing that fills your heart with love quite like a look of devotion from your precious pooch. Now, this beautiful porcelain and glass beaded bracelet lets your heart really shine. 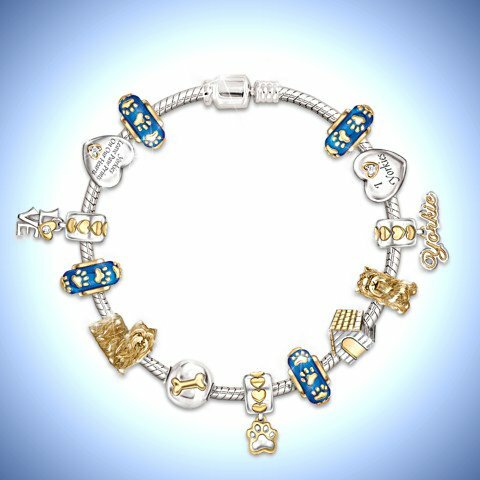 The Bradford Exchange is proud to introduce the Reflections of Love Bracelet, showcasing a charming original fine jewelry design with radiant Murano-style art glass beads and adorable dog art. Best of all, you can choose from Yorkie with art by Pollyanna Pickering, or Chihuahua, Shih Tzu, Dachshund, Pug, Pomeranian, and Schnauzer, with art by Linda Picken. What a dazzling way to put your loving canine in the spotlight! Each distinctive bead in this gorgeous bracelet glows with warm honey and chocolate brown tones inspired by the artists' distinctive palettes. The expressive images of your chosen dog breed are expertly fired onto both sides of the delicate porcelain beads, while the Murano style art-glass beads feature embedded layers of 24K-gold leaf in the center. And since the beads of this porcelain and glass bracelet are individually handmade, no two bracelets look exactly alike! An 18K gold-plated heart charm with a genuine crystal accent and engraved sentiment complete your bracelet, which arrives in a velvet pouch and gift box, perfect for safekeeping or giving as a meaningful dog lover gift. Strong demand is expected, so don't delay. Order now! When it comes to the friendship you share with your furry four-legged friend, your dachshund always brings endless joy to you and your home. Now you can celebrate your lovable dachshund with the Our Love Is Out of This World Dachshund Figurine Collection. A Hamilton Collection first-ever inspired by the imagery of celebrated artist Blake Jensen, this irresistible collection begins with Issue One, I Love You to the Moon and Back. Next to arrive will be Issue Two, Our Love Is Written In The Stars. Soon your collection will continue with Issue Three, You Are My Whole World and additional collectible dachshund figurines, each a separate issue to follow. Each adorable figurine in this collection features a dachshund posed amongst celestial accents such as the moon and stars along with loving title sentiments. Exquisitely handcrafted in artist's resin by Master Artisans, every figurine is hand-painted to perfectly capture the artistry of Blake Jensen. These limited-edition dachshund collectible figurines are a wonderful way to express your love for dachshunds and they make "paw-fect" gifts for devoted Doxie lovers, but don't wait, Strong demand is expected. Order now! Hit the open road and let the fur fly with this adorably cool dude - er, Doxie. Introducing the Cruiser Dachshund Figurine, a first-ever exclusively from The Hamilton Collection. He may look tough as nails, but deep down this Cruiser figurine is just all bark - and the perfect dog figurine for bikers and Dachshund lovers alike! From the tip of his nose to the tip of his tail, this limited-edition Dachshund collectible is handcrafted in artist's resin and hand-painted in extraordinary detail. He's geared up for an epic ride, too, with a "leather" vest over his white tee-shirt, a do-rag on his head, buckled boots, spiked wristbands and a sweet pair of shades - he's even rocking a pierced ear and biker 'stache! Strong demand is expected, so hurry. Order now! Dachshund lovers know their pups are always ready for adventure! And now you and your beloved doxie can hit the open road and let the fur fly with the Live Fur-ee and Ride Hard Dachshund Figurine Collection, a first-ever exclusively from The Hamilton Collection. Your journey kick-starts with Issue One, Cruiser. Next to arrive will be Issue Two, Fleabag. Soon your collection will continue with Issue Three, Kibble, and additional dachshund collectible biker figurines, each a separate issue to follow. These are some seriously cool dudes! The unique dog figurines in this limited-edition collection are each handcrafted in artist's resin and hand-painted in extraordinary detail, from the tips of their noses to the tips of their tails. They're all dressed for the road, sporting classic biker gear like "leather" vests, do-rags on their heads, shades, boots, even pierced ears! You're sure to enjoy showing them off to bikers and doxie-lovers alike, and they make paws-itively perfect gifts too. Strong demand is expected, so don't wait. Order now! From the moment you met, you knew you would become best buds! Now you can show the world just how much that loyal companion means to you with the Man's Best Friend Men's Hoodie, showcasing a custom design only from The Bradford Exchange. The best thing about this handsome dog-themed apparel is that the back of the jacket showcases a printed portrait of the dog breed of your choice, along with the sentiment "MY DOG THINKS I'M AWESOME". Your shared doggie devotion never sported so much style! Superbly crafted for quality, this men's cotton-blend knit hoodie is not only a fine wearable tribute to your favorite four-legged friend, but it's loaded with custom details as well. From its comfortable brushed fleece interior and gray thermal knit-lined hood, to its generous kangaroo front pockets, knit cuffs and hem, full front zipper and silver-toned metal tippets on the hood drawstrings, this easy-care black hoodie is a sharp fit for dog lovers, and their best bud too! Strong demand is expected, so don't wait. Order now! If you've had the joy of sharing a loving bond with a four-legged friend, you know that it's true - they do leave paw prints on our hearts forever. That's why The Bradford Exchange proudly supports the ASPCA's mission to save animal lives. Now, you can let the love of your favorite pet sparkle in style when you wear the Pet Lover's Bracelet, a fine jewelry design exclusively from The Bradford Exchange. This fetching paw print women's bracelet features a link design, is plated in shining sterling silver and sparkles with over 100 genuine Swarovskv crystals! Serving as the centerpiece of this gorgeous crystal bracelet is a heart framed with a pave of Swarovski crystals and a shimmering crystal paw print on the front. The back of the heart is engraved with "A Best Friend Leaves Paw Prints on Your (heart)" with the heart plated in 18K gold. Two bracelet links are adorned with a crystal pave, and a bone-shaped toggle serves as a closure. This adorable fashion bracelet is a must-have for any pet lover and is also a wonderful gift idea for your pet-sitter, groomer or anyone who loves animals! Strong demand is expected. Order now! From the moment you gazed into those puppy-dog eyes, you knew that furry friend would be in your heart forever! 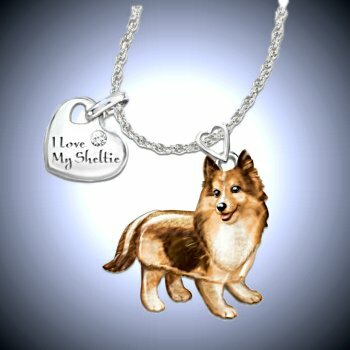 Now you can show the world just how much you love your captivating canine with this dog lovers diamond pendant necklace, a Bradford Exchange exclusive fine jewelry design. 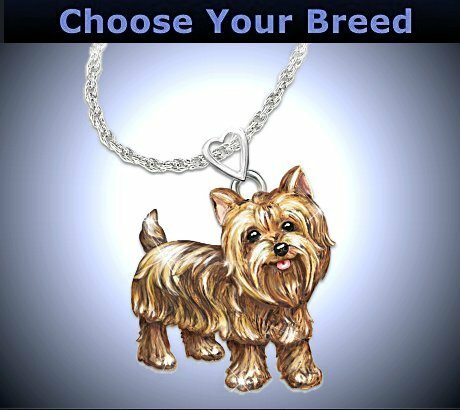 Choose your favorite breed from selections including Yorkie, Pug, Dachshund and more, and your dog's adorability will be forever captured on a sterling silver-plated pendant, hand-painted to highlight the amazing detail. 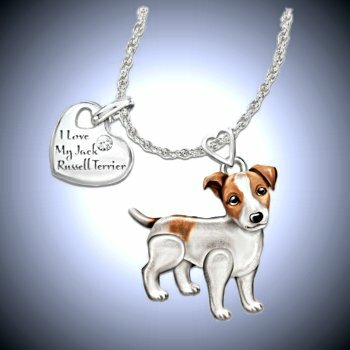 Just too doggone cute for words, this unique dog lovers jewelry is full of "wag and wiggle" as the legs and tail really move. Plus, there is a sterling silver-plated heart charm with a genuine diamond and a breed-specific message that dangles gracefully next to your precious pup. Arriving with a jeweler's pouch and gift box, this beautiful dog lovers diamond pendant necklace is sure to win your heart. Hurry, strong demand is expected. Order now! Whether fetching the paper, happily bouncing beside you on a daily walk, or simply curled up at your feet, it's no doubt that your beloved dog is your loyal and forever friend. Now you can show your affection in beautiful style with the A Loyal Companion earrings with full-color dog art, an exclusive fine jewelry design from The Bradford Exchange. 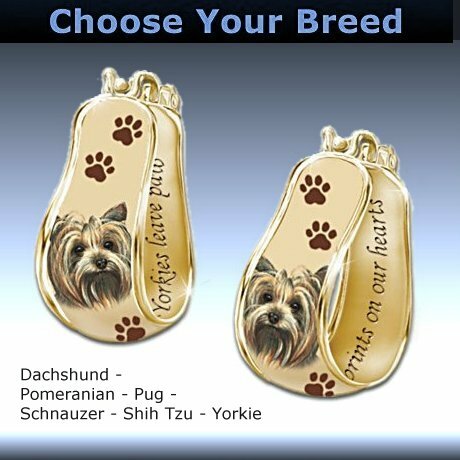 Simply choose a favorite breed from a selection including Yorkie, Dachshund, Pomeranian, Pug, Schnauzer and Shih Tzu. If you truly love your dog, earrings are a great way to display dazzling devotion from ear to ear.Exquisitely handcrafted of solid sterling silver and accented with rich 24K-gold plating, these graceful cuff-style piereced earrings with dog art feature a lively full-color image of your chosen breed, along with a delightful trail of paw prints. And each of these dog earrings for women is elegantly engraved on the inside with a touching breed-specific message too. Don't miss your chance to show your love for a faithful friend. Order now! A description is not yet available. Smart shoppers realize the unparalleled value in specially designed fine jewelry. Meticulous handcraftsmanship, enduring value and exclusive offers are the hallmark of The Bradford Exchange Online jewelry. Strong demand is expected, so don't miss this unique opportunity to reserve yours in advance. Order now!